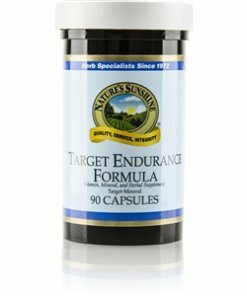 Nature’s Sunshine Target Endurance Formula provides nourishment and energy for strenuous activity. This caffeine-free formula contains the amino acids arginine, leucine, and glycine to assist in energy production. Zinc, a key player in important enzyme functions, is mixed with copper, bee pollen, eleuthero root, gotu kola herb, capsicum fruit, licorice root, glutamine, and choline bitartrate. 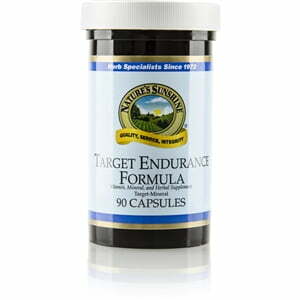 Target Endurance is formulated to help the body easily absorb all the essential nutrients contained within it. Bee Pollen, Gotu Kola herb (Hydrocotyle asiatica), Eleuthero root (Eleutherococcus senticosus), Capsicum fruit (Capsicum annuum), Licorice root (Glycyrrhiza glabra), Ginger root (Zingiber officinale), l-glutamine, choline, gelatin, and water.